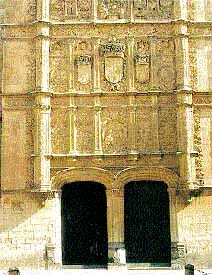 Alfons IX, after the precedence of having created the "General Study of Palencia" in 1215, arrived to the grand idea to create another entity of greater size in Salamanca. The construction began in 1,411 by order of the Pope Benedict 13th, The Moon Pope. Thus, it is the oldest university of Spain, and one of the most representative examples of the Spanish plateresc style. Alfons X, the Wise One, in 1254 assigned the faculty of cathedral to the university. In its façade, filigree and relieves predominate reminding us of the labor of the silversmiths, and therefore the name plateresc (having to do with silversmiths). Over the two arches of the façade, this one is divided into three bodies: the first one displays the seal of the Catholic Kings with the Greek inscription "The Kings to the University, and This One to Them." In the center, the imperial shield of Charles V, and in its superior the figure of the Pope with two cardinals. Plateresc Carvings Over the Façade of Salamancas University. Characterized by the plateresc carving because it augments its size as it gains height, with the plan to provoke the visual effect of it being real. The carving of the "Frog" is very popular amongst the students, which in reality is a symbol of sin. The Library of the Old University. 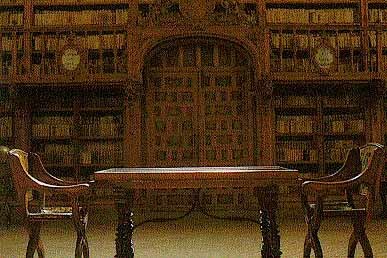 In the superior floor, after the renaicentist grille, you can find the splendid library which houses in its many baroque shelves important manuscripts and incunables of the 11th through the 14th centuries, and about 40,000 books edited between the 16th to the 18th centuries. 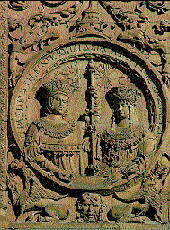 The Pope Alexander IV defined the University of Salamanca as "one of the four torches of the world". 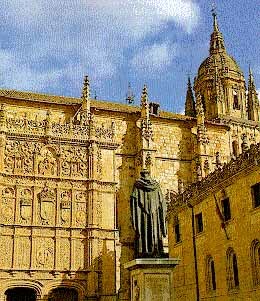 Maybe it is the monument that best symbolizes Salamancas immortality, and unites it to the world of literature and art, having passed through it important personalities such as Fray Luis of Leon, Nebrija, Francisco Vitoria, Cervantes, Mendez Valdez, Saint Juan of the Cross, Miguel of Unamuno, Torrente Ballester, and many others.